1. Correct lumbar spine rotation. Lumbar spine rotation (as well as a l/s lateral flexion) seems to be somewhat common post hip surgery or even spine surgery for that matter. When the lumbar spine rotation and flexion is corrected, the hips are aligned as a result. After being properly aligned, this particular client that I am writing about today almost always say, ‘Now, I feel like I have room for my hips!’. I suspect what she is feeling other times is the pressure being put on one hip as the pelvis dips inferiorly on one side causing that side to feel like it is in a constant state of contraction to maintain a somewhat neutral position. 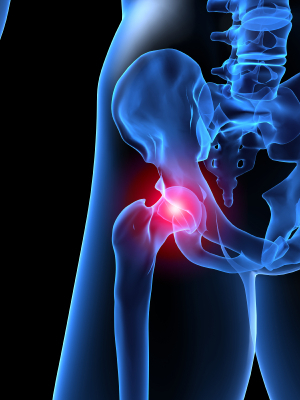 The opposite hip dislocates frequently because it there is not enough contraction. 2. Glut medius and minimus strengthening. Once I get my client aligned correctly, I have her start working on the gluteal medius and minimus. It’s a complete waste of time to work these muscles without first correcting the alignment. Do what you need to do and use what you need to use to gain proper alignment. If you are going to err, try to err in the direction of over-correction. My client always finds her way back to her old pattern fairly quickly. I use a lot of side-lying leg work to strengthen these muscles as well as to work on the obliques. 3. Grooving squatting patterns. After some pain had subsided we began grooving squatting patterns using assistance and a chair that was bolstered up about 10″ above normal. I watch for that lumbar spine rotation and I have her sitting on a rotational disc so we can monitor the rotation.